Thirty years ago today, with millions watching on live TV, the Space Shuttle Challenger exploded shortly after takeoff. All seven crew members died. Something else died too, and I’ll get to that in a moment. First, though, let’s remember those seven who “slipped the surly bonds of Earth” and sought to advance humankind’s understanding of space and technology. I grew up with the space program in the 1960s. I have an early memory of Alan Shepard becoming the first American to travel into space. (My mother, seated next to me at the TV, said “Pray for him.”) I had chills listening to the Apollo 8 astronauts read from the book of Genesis as they orbited the moon. (I still get chills at the memory.) When Neil Armstrong stepped onto the moon a few months later, it felt like the future was full of possibility. In the ’60s the world was a mess, just as it is today. But the mood of the time was that science and technology could solve many of our problems. That they could — no, make that would — make things better for everyone. A succession of World’s Fairs, like the one in New York in 1964-65, gave us a glimpse into a future that looked pretty wonderful. This entry was posted in Media and technology, Society and tagged Apollo 1, Apollo 11, Apollo 8, Challenger, Columbia, NASA, science, space program, technology, World's Fair on January 28, 2016 by Larry Kunz. On a recent visit to Stockholm, Sweden, I encountered this fellow presiding over a pleasant city park that bears his name. I’m ashamed to say that I had to look him up in the encyclopedia. Jöns Jacob Berzelius is considered a pioneer in chemistry, having developed the modern notation for chemical formulas in the early nineteenth century. 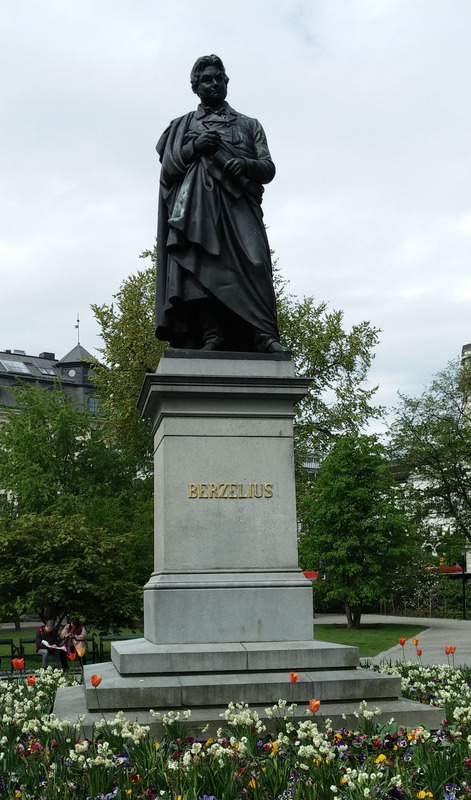 In Sweden he’s so highly regarded that he not only has a park named after him, but his birthday (August 20) is observed as Berzelius Day. What is it about the Swedes – who also created the Nobel Prize – that they so gladly celebrate the great scientists in their midst? More to the point, what is it about us Americans that we don’t? Oh, we love our inventors, because we love their technology and we love the economic benefits that come from their technology. But we rarely celebrate pure science. Where are the statues of great researchers and great theoreticians? Sad to say, many Americans are skeptical of science. They’d rather mock science — for example, by throwing a snowball in the U.S. Senate chamber — than take it seriously. They don’t want to know the earth is getting warmer, because that might mean they can’t drive their beloved SUVs. We love our freedom and we always have. But lately that freedom has turned into a license to live whatever lifestyle we like — with no ivory-tower, pointy-headed scientist telling us what to do. It’s a damn shame. It’s an attitude that will hurt our country severely in the long run. And because our country is so big and so influential, it’s going to hurt the whole world. Already is hurting it. We should take a lesson from Sweden – a country that knows how to honor its great scientists and a country that, not coincidentally, earns high marks for sustainability and for its use of renewable energy sources. This entry was posted in Media and technology, Society and tagged Berzelius, climate change, environment, science, Sweden, technology, United States on June 2, 2015 by Larry Kunz.